Lost Zen-beginner, but with a great heart? BUDDHAPRIYA was an indian Buddhist monk whom arrived around 100 years after Bodhidharmas death to China. Compared to the extreme tamasic Zen style by Bodhidharma, he had a more practical and softer approach to Zen for beginners. Where Bodhidharma style was tamasic (sudden´and ruthless), Buddhapriyas was more Rajasic (patiently kind and gradual) with a pinch of tamasic directness, sternness in terms of discipline and concentration. In this remaining set of instructions (Q&A form) that can be found about his unique style, which is a kind of ‘Zen and Samadhi for dummies’, he begins by describing the proper attitude, a simplified method of entering one pointedness of Mind and also how to recognize the first signs of Samadhi. [Brackets are my own comments to the Q&A]. Question.—How does the Zen practiced by heretics [remember; The ancient Chinese mindset was very territorial in all things, especially in martial art schools and dharma schools and today still is] and by the other schools of Buddhism differ from our Zen? Answer.—The Zen of the heretics is not impersonal. The Zen of the Lesser Vehicle is material. The Zen of the Greater Vehicle only abstracts man and phenomena. Question.—How ought one to set about practicing Zen? Answer.—First put far away from you all anger and malice, and fill your heart with kindness and compassion. [The dharma-seed is planted and begins to grow in your heart, onceheart-hsin is calm and balanced, free from obsessive thought-actions. If it is not in balance, your intellect, nous, can only take you so far before you fall flat on your face]. Question.—Can the beginner at once proceed to the contemplation of non-Being? Answer.— By no means ! He must by stratagems gradually enter in. I have never yet seen one who straightway achieved the vision of non-Reality. If for example he were meditating in this room he must first banish from his mind every part of the world except the city of Ch’ang-an [the current monastery/city of the asking monk, the master basically telling him start undoing the consciousness matrix of its current awareness field HERE]. Next every building in the city except this monastery. Next, every room in the monastery except this cell, every object but himself, every part of himself except the end of his nose. Finally the end of his nose hangs in space like a drop of dew and on this nose-end he concentrates his mind. [this should, for a beginner, take about an hour until he reaches final nose tip – later this can be done in five to ten minutes and finally one day after much practice the student goes straight to the tip in a flash. The last having a myriad cool app possibilities for such a skilled student, that are too many and too extensive to mention here]. This is only a preliminary exercise. There are others of the same kind. For example—persuade yourself that your navel is a minute rivulet running through the sands. When this conception is firmly achieved, you will see a bright light and ultimately, the body growing transparent, you will behold the working of your bowels. Or again, regard your head as the top of a hollow pipe which runs straight down through your body into the earth. Meditate upon the top of your head, that is to say, upon the mouth of the drain-pipe, and then gradually ascend in your thoughts to a height of four inches above the head, and concentrate firmly on this conception. You will thus easily pass into the contemplation of non-Being, having performed the transition from elementary to complete Zen as comfortably as a workman climbs the rungs of a ladder. Question.—Are there any signs whereby I may know that I have attained to Samadhi? Answer.—To be sure there are. Sometimes you will feel a sensation as of bugs or ants creeping over your skin ; or again, it will appear to you that a cloud or mass of white cotton-wool is rising immediately behind your back. In neither case must you be discomposed or put out your hand. Sometimes it will seem as though oil were dripping down from your head and face ; sometimes a light will shine from out of the ground you are sitting upon. These are all preliminary signs. Sometimes when you have been sitting for a long while and your back is aching, you will suddenly hear a sound of rapping with the fingers or a noise as of some one bumping against the door. Do not be disquieted. These are the Good Spirits of Heaven, come to warn you against sleep. Again, it may happen that you have an agreeable sense of lightness and floating ; this is a good sign. Beware, however, of a painful sense of lightness ; for this may merely indicate flatulence. Patches of heat on the body are a sign of Fiery Samadhi. A light filling the whole room is a premonitory sign of Zen ; to smell strange fragrances not known on earth is a sign of whole and utter Abstraction. Such and many more are the signs of Zen. The practicant must not heed them ; for if by them he be encouraged or dismayed, all his work will be undone. 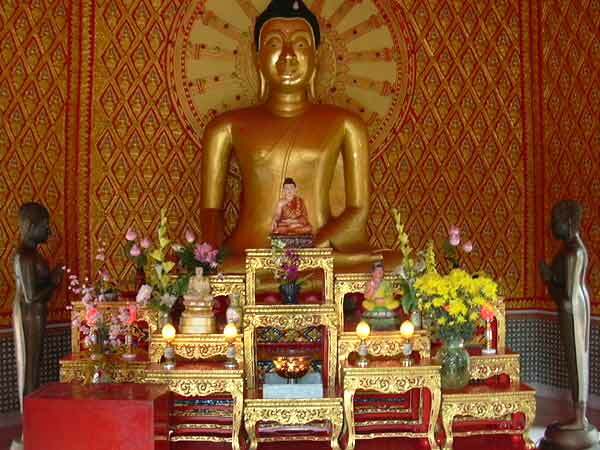 Question.—Can Zen be practiced in a Buddha Shrine? Answer.— No, indeed ! Zen should be practiced in a quiet room or under a tree or among tombs or sitting on the dewy earth. Question.—Can Zen be practiced by many sitting together? Answer.—To be sure it may ; but each must face his neighbour’s back. They must not sit face to face. When there are many sitting together at night, a lamp or candle may be lit ; but when Answer.—To be sure it may ; but each must face his neighbour’s back. They must not sit face to face. When there are many sitting together at night, a lamp or candle may be lit ; but when there are few together, it ought not to be used. Question.—Need I wear monastic vestments at my meditations? Answer.—Vestments? Why, you need wear no clothes at all, if so be, you are alone. This entry was posted in Tozen Teaching and tagged BUDDHAPRIYA, Dhyana, Dhyana Masters, Mind, signs. Bookmark the permalink. 1 Response to Lost Zen-beginner, but with a great heart? 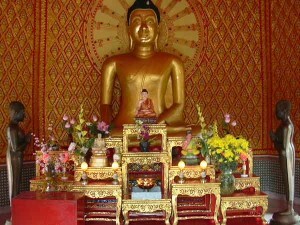 In the Pāli discourses, the Buddha more than once advises the practicant to seek out a secluded locale. The places auspicious include a forest, under the shade of tree, high on a mountain, or in a wooded glen, a hillside cave (or abandoned mine), a charnel ground (i.e. boneyard or burial place), a jungle grove, out in the open, or, lastly, on a heap of vegetation (haystack or pile of leaves).